Looking for the best places to cross-country ski and snowshoe in Ontario? 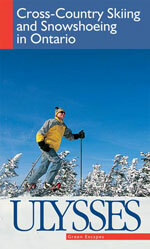 The Ulysses Cross-Country Skiing and Snowshoeing in Ontario guide has them covered! In this unique guide, you’ll find clear directions, detailed descriptions and a list of the author's favourite trails. Cross-Country Skiing and Snowshoeing in Ontario covers more than 200 skiing and snowshoeing areas all across the province, from the Greater Toronto Area and the Niagara Peninsula to the great expanses of Northern Ontario. Several long-distance multi-region trails are also covered, including the Bruce Trail, the Voyageur Trail, the Trans Canada Trail and the Waterfront Trail. Clear indications of difficulty levels are provided, and some 20 detailed maps will help you get around. You’ll even get a quick Ontario geography lesson and a winter-bird checklist to help you better appreciate your surroundings, as well as advice on off-season training, what to wear, trail etiquette and cross-country skiing and snowshoeing techniques. All this, plus the art of ski waxing demystified!